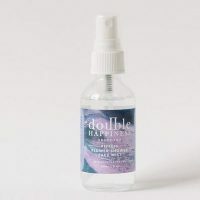 Around a year ago, we brought into the shop a new women’s skincare line called Double Happiness Skincare. With co-creators Sonja’s and Young’s background in herbology and their love of essential oils, they developed a healthy, vegan and organic choice for skincare. Personally, having been diagnosed with eczema and allergies to synthetic fragrances, I was constantly experiencing major flare ups over the last several years and was seriously intent on finding Canadian products that were ph-balanced, simple, plant based with no added fragrance or perfume. Double Happiness Skincare was mindfully created in 2015. 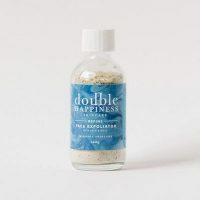 By using powerful active botanical and elixirs that are hand-blended and filled with healing properties, Double Happiness Skincare re-balances, strengthens and nurtures the skin. An easy and relaxing skin ritual consists of: RESTART FACE OIL CLEANSER, REFRESH FLOWER SHOWER FACE MIST, RESTORE FACE OIL POTION used in the morning and at the end of your day, as well as REFINE FACE EXFOLIATOR used once a week or when needed. This first step to cleaner skin is filled with botanical oils are that are ph-balanced for your skin. Filled with pumpkin seed oil that is rich in essential fatty acids, vitamins, minerals and antioxidants which easily removes makeup and deeply cleanses with the intoxicating smell of rose and neroli. Using several pumps gently massage onto your moistened face and wash off with warm water or a warm wet face cloth. Doing this during your morning shower routine is very relaxing and easy. Your face is now ready for the next easy step. 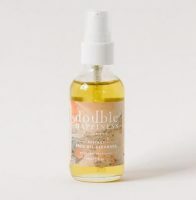 With organic botanicals of rose hydrosol and essential oils, this light mist calms inflammation and hydrates the skin. It also effectively sets your makeup and leaves your face with a dewy glow. It’s a must throughout the day and when travelling, especially when flying, and instantly refreshes your face. Remember to shake well before use. NOTE: FACE OIL DOES NOT MAKE A GREASEY FACE!! 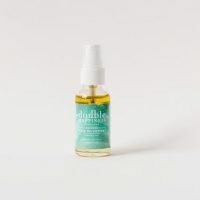 Only a few drops are needed of this elixir filled with powerful active botanicals and schizandra berry which has been used over 2 thousand years ago to nourish the skin, improve elasticity and reverse the effect of free radicals. Magnolia leaf, pomegranate and sea buckthorn are rich in antioxidants, omega and vitamins which strengthens weakened skin, reduces inflammation and promotes healing from sunburns, eczema, psoriasis, acne scarring and hyperpigmentation. Broccoli seeds within the elixir also helps to keep your skin hydrated. The rosehip is not only a lovely natural fragrance but is high in OMEGA 3 and 6 and stimulates collagen especially for mature skin. Using a blend of natural ingredients that gently exfoliates the face and hydrates it, to create radiant skin. When used weekly or when needed, follow with the refresh shower face mist and restore face oil potion. “DOUBLE HAPPINESS SKINCARE uses the finest ingredients available in the natural world that are harvest sustainably and mindfully. Joyfully handcrafted in small batches, their products are a ritual self-love, preserved by nature for healthy and happy skin”.